← NEMO results are in–I can’t wait to see them! I just know that I’m hurting and I’m tired of being sick. I know that I look healthy, but I also know I have many diseases going on inside that are being masked by my healthy exterior. I am a hypochondriac’s dream. I am actually really sick. 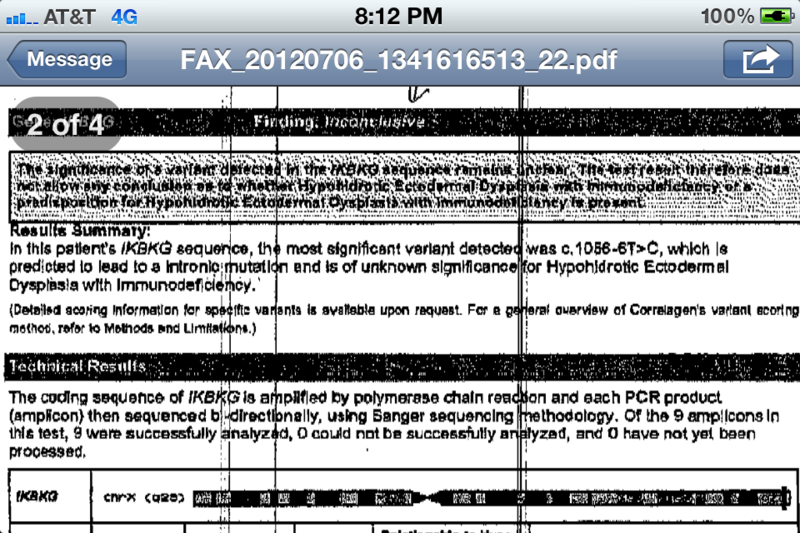 The significance of a variant detected in the IKBKG sequence remains unclear. The test result therefore does not allow any conclusion as to whether Hypogydropic Ectodermal Dystplia immunodeficiency of a predisposition for Hypohidroic Ectodermal Dysplaxis with immunodefiency is present. In this patients IKBKG sequence, the most significant variant detected was c. 1056-6T>C, which is predicted to lead to a intronic mutation and is of unknown significance for Hypohidrotic Ectodermal Dyspsia with Inmunodeficiency. (Detailed scoring information for specific variants is available upon request. For a general overview of Correlagen’s variant scoring method, refer to Methods and limitations). Yes there are loads of DNA changes (i.e. mutations) in human genes having uncertain or inconclusive significance due to limited amount of knowledge in the field about those specific mutations. Sometimes, a DNA change in a gene can be seen in individuals who have a genetic disease as well as in individuals who are healthy. This is the common case that prompts a DNA change to be inconclusive but there can be many other reasons that lead to instances of inconclusive results. In such case, it is uncertain whether the DNA change is causing the disease or not. The only best way of circumventing such problem is that HEALTHY individuals with such inconclusive results have to be followed by doctors, genetic counselors or any stakeholder in concern for ‘wait and watch’ strategy and intervention methods should be applied as soon as the individual tends to develop the disease due to such inconclusive DNA change. Furthermore, such individuals are also required to consult to the institution offering the testing as interpretation of such inconclusive DNA change may change as newer information comes in the field. If a subject has such inconclusive DNA change and the subject has the disease associated with the gene, it is up to the Doctor’s decision. In your case, I think there is not so much to be hypochondriac and worry about. However, it can not be ruled out that you may not develop Hypohidrotic Ectodermal Dyspsia or Incontinentia pigmenti in your lifetime. But luckily you may not also develop those diseases and live healthy!